Boris He’s a really good camel but he’s bored because he doesn’t have a job or things to do besides chase smaller animals an be a bully. As always he’s loving and gentle (mostly), but I realized that I either had to spend much more time with him or find something to do with him. We decided to send him to Pettit Creek Farms so he could get some basic camel training. He’ll be off in a few weeks and we’ll pick him up when we return from Daytona Bike Week. Remember, we have REAL jobs… my husband & I own Boogey Lights – we sell & install accent lighting on motorcycles. At this time Boris’ buddies are my little Nigerian Dwarf Goat studs, Flip & Samson. They stay away from his head (Boris often tries to nibble them), but they’re doing a great job by eating all the hay that Boris drops! Boris doesn’t really pay attention to them unless I am… then he gets jealous and tries to nibble them! Ziggy He’s doing very well also. He’s much calmer and has become very loving. I can put a halter on him in about 2 minutes (used to be 10), but he’s getting much better. It’s all about trust and he’s slowly gaining it with me. Miniature Donkeys Madigan & Daisy June will be 2 years old in April & May. They’re like teenagers at this stage in their lives. They’re adorable, gentle and always want to eat! I’d love to have time to train them to pull a cart… they’d make a wonderful team! For the time being, they’re just enjoying the larger pasture . Miniature Horses Toffee (the little filly), has become quite tame. She’ll follow like a large puppy and also loves to be scratched and petted. She currently runs in the pasture with her buddies, the donkeys. Today will be a sad day for her as we’re trading her momma Princess, for a handsome gelded Llama. We think Stormy will be a nice addition to the farm and that he’ll be a good buddy for Boris. Goats In the last few weeks I’ve picked up 6 new goats. Five were from the same source, a nice farm out of Crossville. From there I purchased 2 nanies with 3 kids between the 2 of them. They’re a little shy right now but with patience and love, they’ll be fine. The nannies are Molly Too & Nelly and the does are Patches, Waddles & Cocoa. When I purchased the bunnie buddy I also purchased a beautiful, very sick little orange doe. She had been caught in a fence and spent the night in torrential rains. I was fully aware of how sick she was but when I saw her, I thought I’d be able to help her more than the current owner. Unfortuneatly she was too far gone when I took her in and wasn’t able to save her. However, the fellow who sold her to me was kind enough to replace her. Wouldn’t you know it, this little doe was also sick. She had the beginnings of a very serious cold (might have been pneumonia), but with much love, pennicilin twice daily for 5 days and the help of my neighbor Mary, we were able to pull her out of it. “Booger” as I call her, still has a runny nose and is a little skinny and weak but she’s out and about now and making new friends. All the other goats are doing fine. Gracie, Nutmeg, Willy, Chilly – they’re as cute as can be and are all over the place! Because of the wet weather we’re having they’re always playing inside the barn. Their favorite thing is “who can climb the highest on the hay pile” game! I’m looking forward to spring time so that I can let all the bigger goats roam in the large pasture – hence keeping the barn area much cleaner! 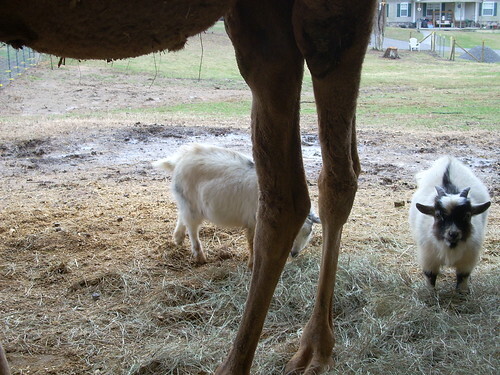 Right now ALL the goats stay under cover. At last count, I have 25 goats – that’s a lot of goat poop to pick up! Dolly the Baby Doll Sheep I advertised her for sale and got several inquiries. The funny thing that happened was it appeared that Dolly wasn’t pregnant which was the main reason I bought her. She’s not friendly at all but I was hoping that one of her lambs would be. When I saw that she wasn’t about to have lambs, I put her up for sale. As soon as I started getting “bites” on the ad, it looked like she had doubled her size in width. She may be pregnant after all! I made a deal with a lady that if Dolly had twins, I just wanted one lamb to bottle feed and she could have Dolly with the other lamb. So we’ll see what becomes of it – I’m going to give her until mid-February! Lulu & Grumpy The odd couple is doing fine. They share a goat shed and have made a huge nest with hay and old blankets. Now I know where the expression “pig in a blanket” comes from! Grumpy actually wraps himself in the blanket in the hay to sleep at night! During the winter months, pigs retire early & I’ve checked in on them to find them totally buried in the hay and Grumpy in his blanky! Bunnies Well, Floppy & Fuzzy have mated and I’ll probably have bunnies for sale in about 6 weeks! Pica & Syke Our Great Pyrenees sisters have been adopted by a loving family in Riceville, TN. Although beautiful & gentle dogs, they were not appropriate farm dogs. They loved to chase the baby goats and the chickens. Being so large, they could easily kill a goat and have accidently mauled a few hens. I was fortunate enough to find a very good home for them where they will be surrounded by real kids and big cows – no worries there! Fowl I still have the male and female peacocks. The male is always “flirting” with the black hens but he isn’t getting anywhere. I still have the white Bantam Cochin rooster and 5 hens that lay 2 to 3 eggs a day (I think it’s too cold for more!). I gave the 2 turkey hens to my neighbor – they were getting bigger and stupider and would roost from the rafters of the barn. Ever get hit by turkey poop? YUK!